As a person who has experienced partial and full burial in avalanches, I can assure you that it’s one of the scariest things you’ll ever encounter. As much as I love all the new high-tech gadgets, I have several concerns about the proper use of Avy packs. With January being the deadliest month for avalanches in 20 years, this subject is especially important. 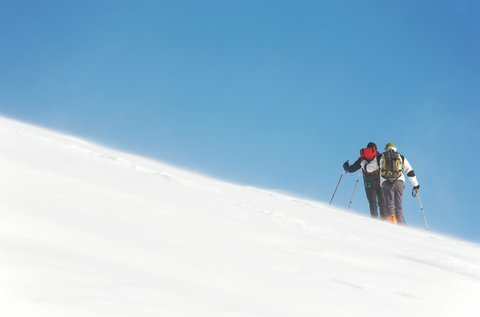 The idea is brilliant and although the actual statistics are limited (most are performed by the companies who build the packs), the results do show that you are twice as likely to survive a medium size avalanche if all the conditions are in your favor. Unfortunately, the universe is the one that decides that. Roughly 20 percent of mishaps with these packs are due to non-inflation which brings up an interesting question: Do most people have the presence of mind in the face of a traumatic event to manually inflate their airbag? If you drop off a big cornice, lose your footing and start a slide, are you going to be able to remember to inflate your pack? I had a friend die by falling off his bike while moving at about 2 miles per hour. He opted to save his coffee and that subconscious reaction cost him his life. The major concern I have about these nifty packs is the false sense of security they provide to a user who has little or no experience with avalanche safety. Let’s face it, most weekend warriors who venture into the mountains after a big snow are souped up on adrenaline and have limited time to fully prepare. A pair of skiers at Mammoth Mountain Resort in California recently got caught in a small avalanche they captured on video. Here in the West (California for instance), avalanches are not as common as they are in other states such as Utah and Colorado. In my 40-something years at Lake Tahoe, I only saw a couple of giant avalanches (two of which took out entire ski lifts) and the rest were relatively mild and far away from typical recreational areas. There is, however, an increased danger this year due to the heavy snow and fluctuating temperatures. There is also an increased desire to get to epic areas in the backcountry. As an avid snowmobiler, the latest technology allows us to get to places we never thought we would reach. This technology has allowed less advanced sledders to get almost anywhere. I’ve seen people in places they never should have gone and I’ve observed many unsafe riding practices. The bottom line is that many people think that as long as they have an airbag, they will be safe in a slide. This false sense of security is a danger to the individual and other skiers/riders etc. in the general area. Avalanches are nothing to take lightly and their destructive power is more brutal than most people think. The reality is that even if you are riding along on top of the snow with your $1,000 airbag, so are trees, boulders and giant chunks of ice and snow. Throw a pair of boots in a drier with an egg and see what happens. I have seen bodies twisted and pulverized by avalanches. It’s not a pretty sight. The best advise is to do your homework and take an avalanche safety course before going into uncontrolled (non-avalanche blasted) terrain that tempts you to venture beyond your edge. A simple Google search can provide valuable information of how to cross avalanche slopes safely, when to stay out of shoots, how to approach cornices, and most importantly, when to stay home. Nature doesn’t care how much you’ve spent or how pretty your jacket is. It will kill you if you don’t pay attention to what it’s showing you.